In 2016, fate struck us once again in the rugged mountains of Mendocino County. Our feet, it seemed, were leading us down a path towards a fledging wine brand. Riesling was my first wine love; I’d probably be working in a cubicle somewhere were it not for Terry Theise’s Reading Between the Wines and the ready availability of the Skurnik portfolio in upstate New York. Riesling provided the door into the ethereal, into wines that tasted like mineral water, flowers and citrus, and of somewhere. This, along with my lack of enthusiasm at the way my case interviews were going for prospective management consulting jobs, propelled me from the East Coast to the Gold Coast in a matter of months. I long harbored a desire to make Riesling, if only to drink my own stash, but thought the pickings of great Riesling vineyards slim (if nonexistent) in California. It was a firm and ill-founded dogma, and experience opened my eyes. Cole Ranch had been on my radar, and in the middle of harvest craziness I heard that the vineyard had changed hands and wondered who would take the fruit. With a rare Saturday off, I convinced Em to drive the two hours up to Mendocino with me, armed with a few business cards and trove of cautious optimism. We drove up Highway 253 and pulled over to peek at the vineyard, looking for picking bins to give us a sense of who was buying the fruit. After some quick marital negotiating and a panicked moment rummaging around the car for a pen, I scrawled out a note on our paper lunch sack and binder-clipped it to the fence with my business card. (Em is still proud that her car-hoarding tendencies provided us the tools to succeed in that moment). 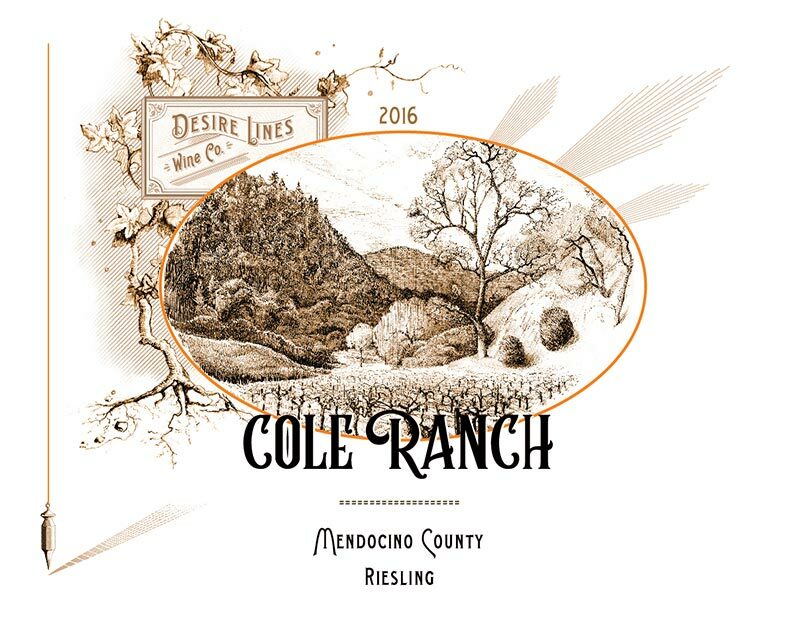 Cole Ranch is a rare jewel – a cold vineyard site with a long growing season, perfect for Riesling. The vines were planted at Cole Ranch in 1973 on St. George rootstock, head-trained and dry-farmed. The vineyard sits in a narrow valley in the mountains between Boonville and Ukiah. The soils warm up late in the spring, the valley tends to stay shaded by the sharp mountain ridges above, and temperatures plummet at night as cool air flows downhill into the vineyard. The grapes were picked perfectly ripe at a cool 21°brix and a pH below 3.0. Like the German Grosses Gewächs Rieslings that we love so much, the wine is a study in tension and richness, with a few grams of residual sugar retained to balance the abundant acidity. This is dry Riesling rendered in pointillist detail, shimmering and limpid. © 2019 Desire Lines Wine Co.